Covering the Nebraska State High School Football Championships in Lincoln, Neb. is always a treat. This year we had four teams we covered that played in championship games. One city school (Grand Island) and the other three are area teams (Aurora, Burwell and Ord). Two of these area teams Aurora and Ord matched up in what would be Ord’s first appearance in a state championship football game. These young men give it their all and are a lot of fun to photograph. Good times! 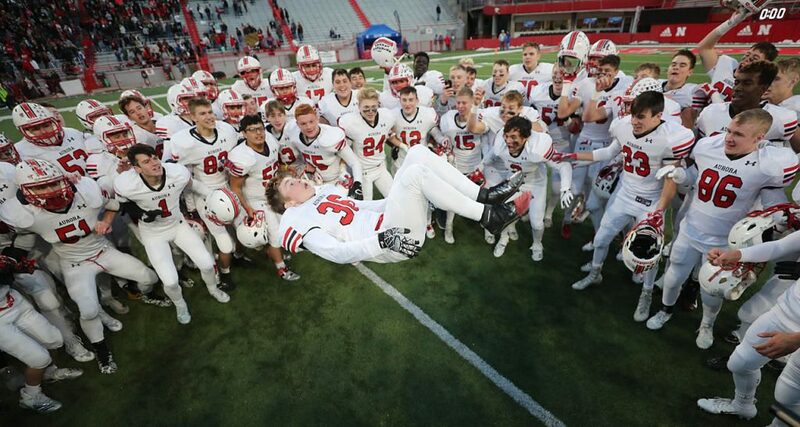 Aurora freshman Alexander Peters does a back flip as he and his teammates celebrate their 49-7 victory over Ord during the Class C1 Nebraska State High School Football Championship game at Memorial Stadium in Lincoln Tuesday. Aurora junior Kaleb Moural scores against Ord on a touchdown carry during the Class C1 Nebraska State High School Football Championship game against at Memorial Stadium in Lincoln Tuesday. Aurora won 49-7. 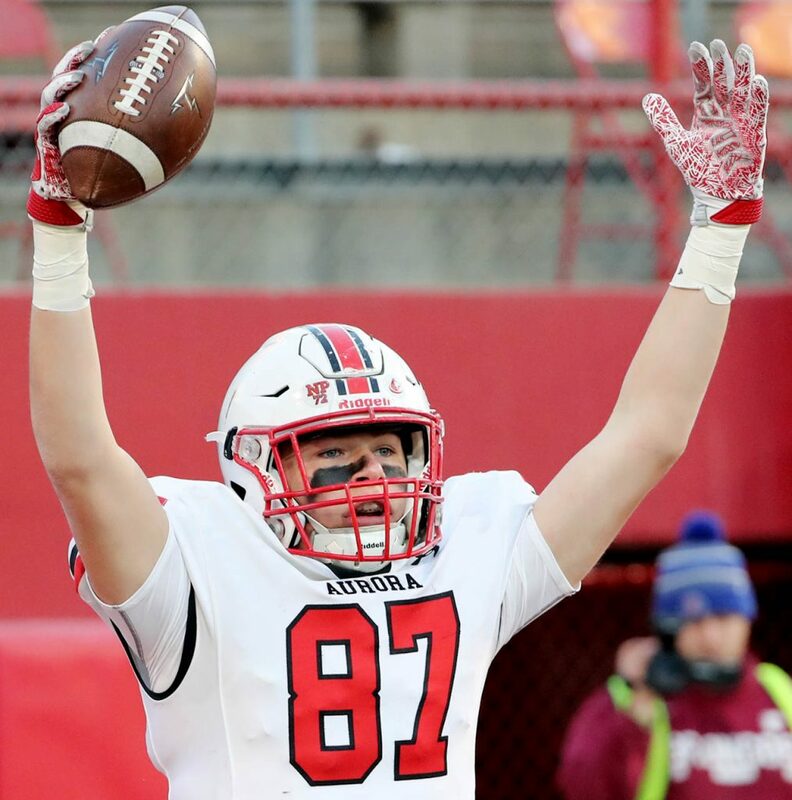 Aurora senior junior Nathan Boerkircher signifies a touchdown score against Ord during the Class C1 Nebraska State High School Football Championship game against at Memorial Stadium in Lincoln Tuesday. Aurora won 49-7. 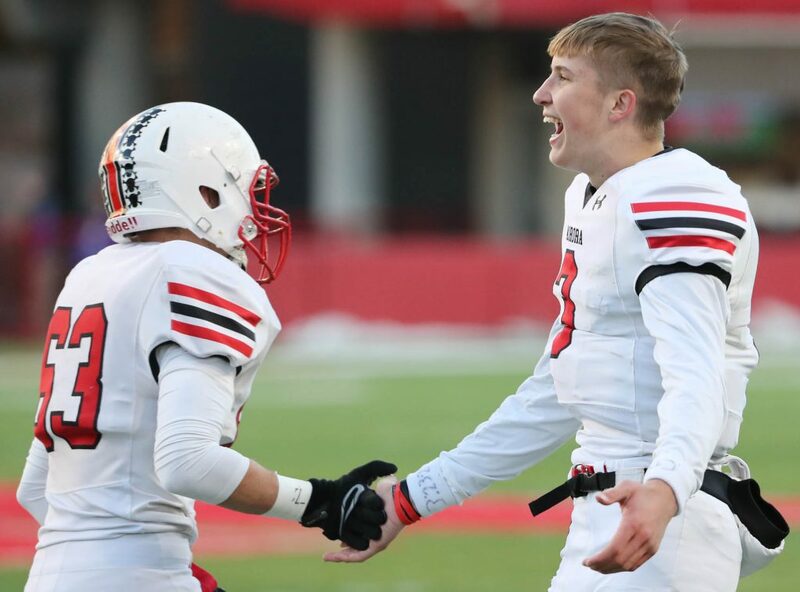 Aurora senior quarterback Baylor Scheierman gives a five to his teammate senior Bradly McDonald (63) after a touchdown score against Ord during the Class C1 Nebraska State High School Football Championship game against at Memorial Stadium in Lincoln Tuesday. Aurora won 49-7. 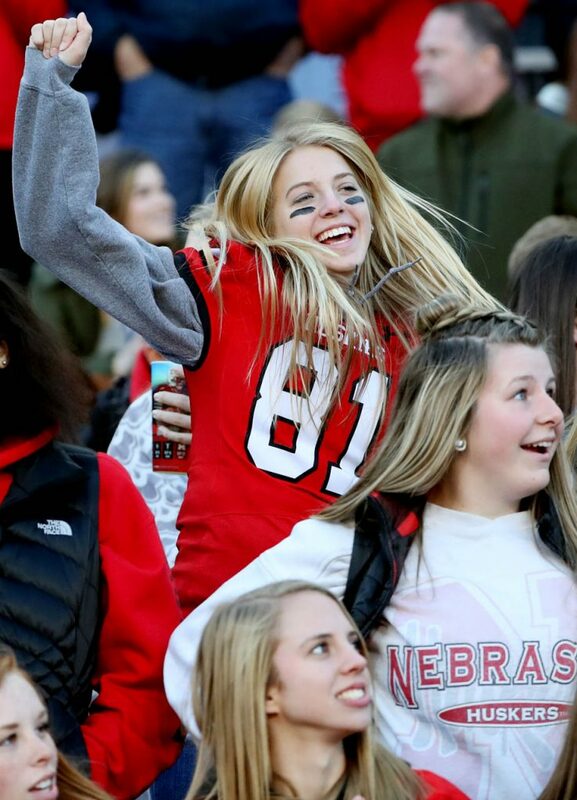 Aurora fans celebrate a touchdown against Ord during the Class C1 Nebraska State High School Football Championship game against at Memorial Stadium in Lincoln Tuesday. Aurora won 49-7. 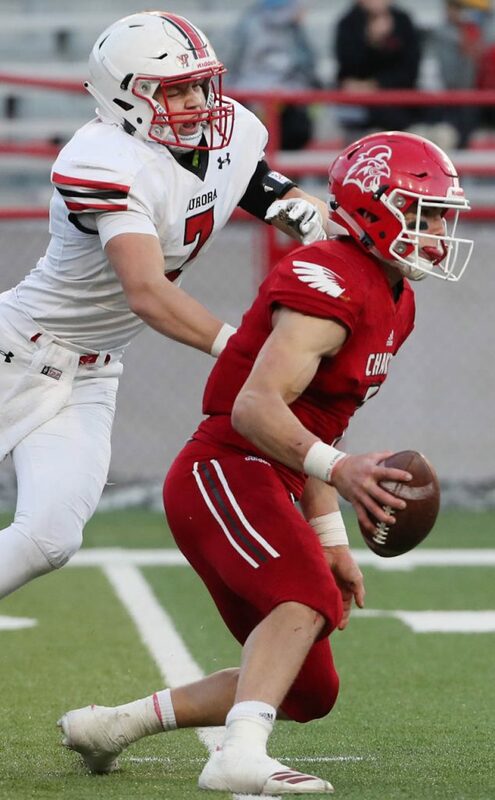 Aurora junior linebacker Trevor Dvorak, left, sacks Ord senior quarterback Jesse Ulrich during the Class C1 Nebraska State High School Football Championship game against at Memorial Stadium in Lincoln Tuesday. Aurora won 49-7. 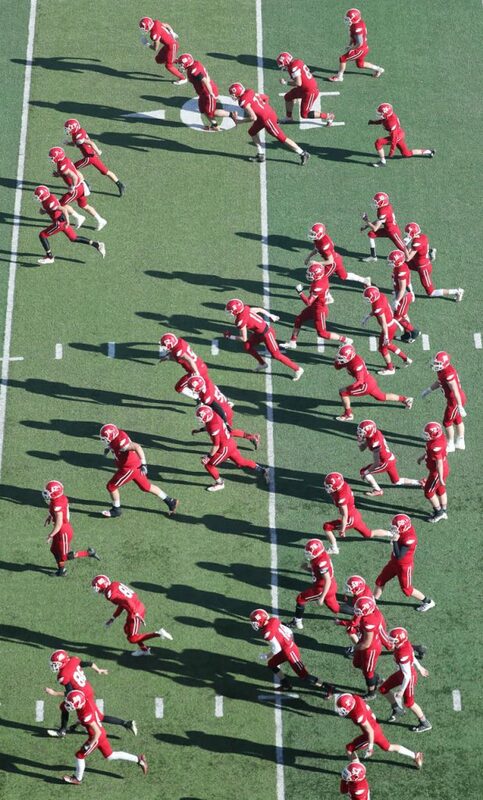 Ord players warm up prior to playing Aurora during the Class C1 Nebraska State High School Football Championship game against at Memorial Stadium in Lincoln Tuesday. Aurora won 49-7. 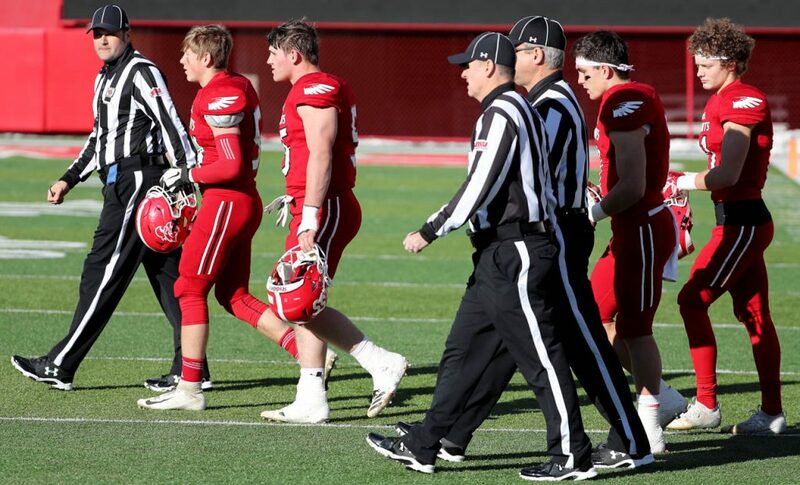 Ord team captains Cooper Tonniges, Ethan Gabriel, Jesse Ulrich and Solomon Campise walk with referees for the coin toss during the Class C1 Nebraska State High School Football Championship game against at Memorial Stadium in Lincoln Tuesday. This was Ords first state championship football game in school history. Aurora won 49-7. 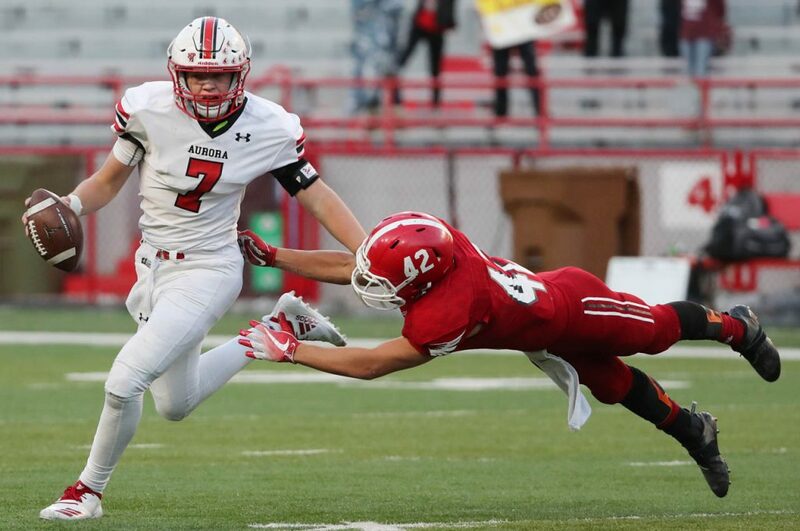 Aurora junior quarterback Trevor Dvorak escapes a diving tackle attempt by Ord sophomore linebacker Tommy Stevens during the Class C1 Nebraska State High School Football Championship game at Memorial Stadium in Lincoln Tuesday. 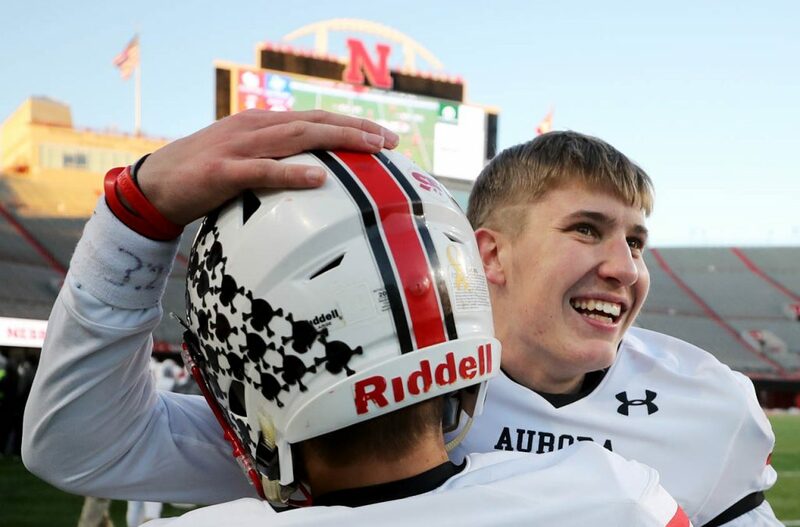 Aurora senior quarterback Baylor Scheierman celebrates with his teammate Kolby Wessels in the closing seconds of the Class C1 Nebraska State High School Football Championship game against Ord at Memorial Stadium in Lincoln Tuesday. 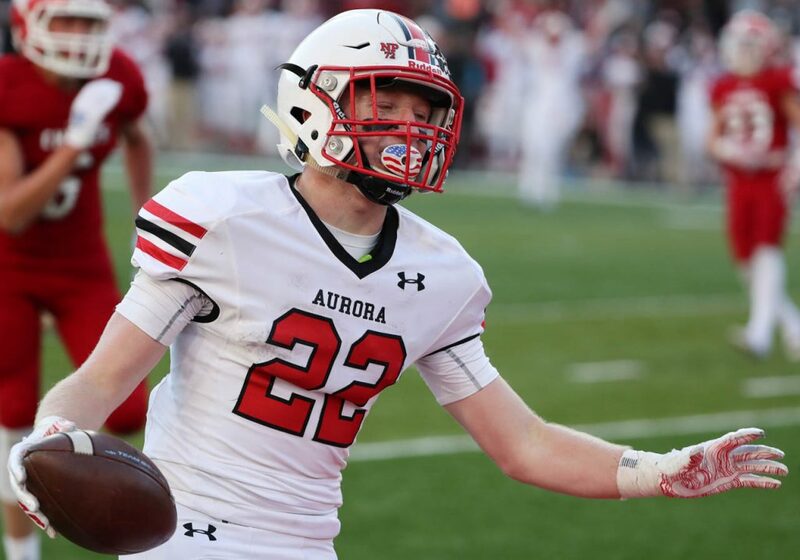 Aurora won 49-7. 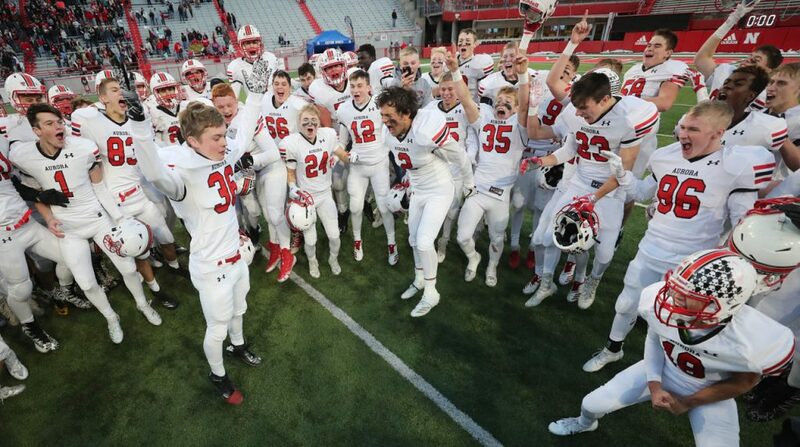 Aurora freshman Alexander Peters raises his hands in the air after doing a back flip as he and his teammates celebrate their 49-7 victory over Ord during the Class C1 Nebraska State High School Football Championship game at Memorial Stadium in Lincoln Tuesday. This entry was posted on November 21, 2018. It was filed under Uncategorized.